Yesterday I was working from home and had a phone appointment until 5:45 pm, and my husband planned a special surprise. 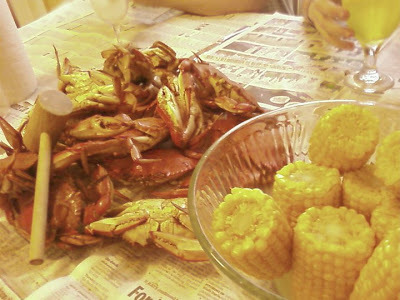 He could hardly wait for me to come out and see what he had planned...an amazing feast of steamed crabs and corn! I'm from Baltimore and steamed crabs to me are no other way than the B'more way. We've never been able to find them here in Florida but yesterday Larry was driving home from work and saw a sign that advertised blue crabs. He stopped and ask the man if he could steam them our way. The man had no clue what he was talking about and Larry had to explain to him how to do it with the Old Bay Seasoning. The guy thought it was a little odd (he was a man from the middle east - had never seen anything like it) but he did as Larry asked him to. The result: amazing! I came out of my room and saw everything set up on the table and FREAKED! I have the most amazing man.. Thanks babe. Now THAT'S an AWESOME surprise!!! Very cool!